John W. Gramlich was born circa 1844. He married Mary Harris circa 1868. Mary Harris was born circa 1844. She married John W. Gramlich circa 1868. As of circa 1868,her married name was Gramlich. [S122] H. H. Hardesty, HH Hardesty, Monroe, 2p. 7, last section. [S135] James Denbow, "Clan of Soloman." [S136] Denbow-Smith (Ky): Dodd, Jordan. Kentucky Marriages, 1802-1850 [database on-line]. Provo, UT, USA: Ancestry.com Operations Inc, 1997. Original data: Electronic transcription of marriage records held by the individual counties in Kentucky. Tillie E. Bender was born circa 1895. Richard Clegg was born in 1856 at Ohio, USA.1 He married Mary C. Denbow, daughter of Bazzel Denbow and Ruth Tanner, circa 1878. 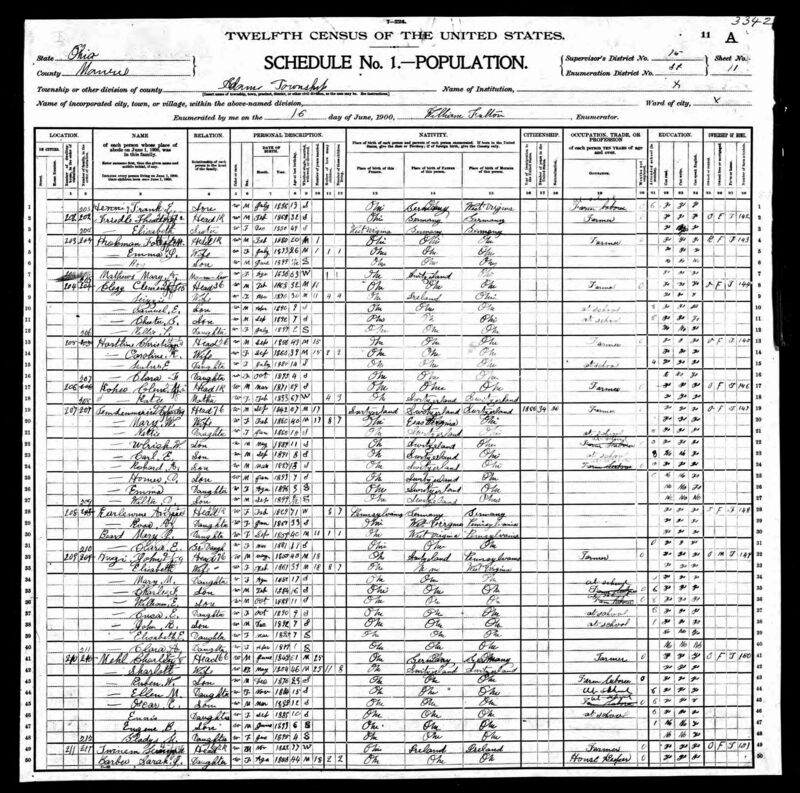 [S144] 1880 U.S. Census, http://www.denbowtree.org, Schd 1, Page 4-5, Sup Dist 7, Enum Dist 132, These two pages contain information on the following related families: Levi Denbow, John Denbow Jr., Martin Denbow, Bazzle Denbow, and Richard Clegg. Stephen Clegg was born in 1882 at Monroe, Ohio, USA.1 He died before 1945. Clement R. Clegg was born in 1879 at Ohio, USA.1 He died on 20 May 1930 at Franklin, Ohio, USA. Charles Raymon Clegg was born in 1879 at Ohio, USA.1 He died before 1945. Grover S. Clegg was born in 1886 at Ohio, USA.1 He died before 1945. John W. Thompson was born circa 1858. He married Lydia May Devor, daughter of Nicholas Devor and Rachel Hayes, on 27 November 1880 at Darke, Ohio, USA.